WASHINGTON (Reuters) – Republican U.S. 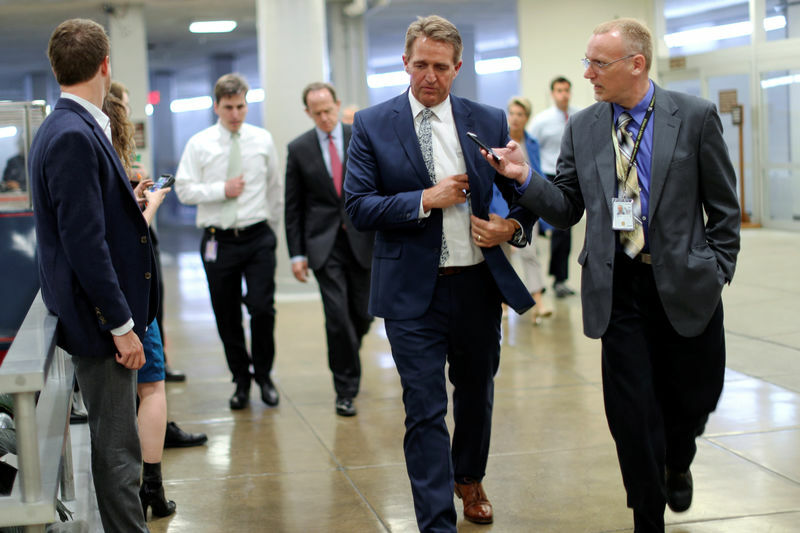 Senator Jeff Flake, who has not ruled out running against Donald Trump for the White House, on Sunday criticized as a “diversion tactic” the president’s unsubstantiated allegation last week of an FBI “spy” being planted in his election campaign. Flake’s comments, on NBC’s “Meet the Press,” put him again at the forefront of very few Republican lawmakers willing to openly challenge Trump over his attacks on law enforcement officials who are investigating Russian meddling in the 2016 U.S. election and possible collusion by the Trump campaign. Flake said Trump’s unfounded allegations about FBI spying on his campaign, which the president has called “Spygate,” came amid escalating, behind-the-scenes concern in the U.S. Senate that the president may try to stop the probe by firing Mueller or the person who appointed him, Deputy Attorney General Rod Rosenstein. In a tweet on Sunday, Trump called the investigation a “phony Russia Collusion Witch Hunt” – reiterating his oft-stated resentment at the probe that has clouded his presidency. After Trump demanded an inquiry into his “spy” claim, the current FBI Director Christopher Wray and Rosenstein, who oversees Mueller’s probe, held two classified briefings on Thursday for senior lawmakers of both parties on the matter. “What I have seen so far is an FBI effort to learn more about individuals with a history of bragging about links to Russia that pre-exist the campaign. If those people were operating near my office or my campaign, I’d want them investigated,” said Rubio, who ran unsuccessfully against Trump in the 2016 Republican presidential primary campaign. “If it turns out to be something different, we want to know about it. But it is the FBI’s job to investigate counterintelligence,” Rubio said. U.S. intelligence agencies concluded in January 2017 that Russian President Vladimir Putin ordered an effort to meddle in the U.S. election campaign, included seeking to help Trump win. Moscow has denied the charge.